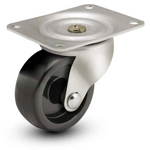 Acorn™ is known as the Caster and Wheel Experts for U.S. and EURO standards. 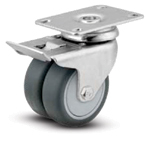 We offer the best casters and wheels to meet every load requirement and application from Categories 1-10. Load Capacity Up to 175 lbs. Load Capacity Up to 230 lbs. • 4-Sided Double Ball Raceway: Hardened steel ball bearings touch upper and lower swivel raceway “on all four sides.” This protects the pin from shock loading for free swiveling under heavy loads. • Heat-Treated Moving Parts: All moving parts are hardened to a precise molecular depth and Rockwell hardness. This extends caster life under rugged conditions and shock loads. • Raceway Dust Cap: Dust cap protects the raceway from contamination by dust, dirt, moisture, and other environmental debris. 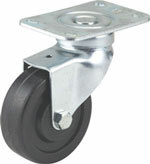 While standard on 50 series casters, these are usually not available on most competitive brands. • Low Overall Height: Heavy pianos are supported by two wheels that roll independently to assure easy maneuverability on any floor surface. • Raceway Dust Cap: Dust cap protects the raceway from contamination by dust, dirt, moisture, and other environmental debris. 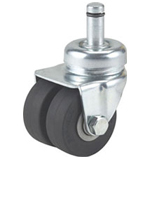 While standard on the 50 Series casters, these are usually not available on most competitive brands. 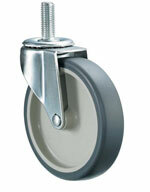 • Thread Guard: Thread guards keep unwanted materials out of the wheel bearings thus increasing the life of the caster. Thread guards are standard on nearly all 50 Series wheels. For years, Airlines have suffered with the high cost of inferior meal and beverage cart casters. The CartMaster is the answer to this problem. 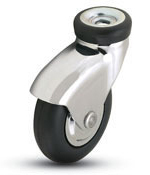 The patented design makes brake adjustment, wheel replacement, lubrication, and damaged swivels a thing of the past. 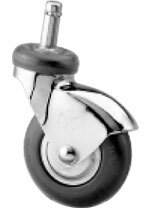 Specially designed Neoprene wheels reduce expensive cart damage by absorbing shock on both carpeted and non-carpeted surfaces. Tests prove that CartMaster wheels last 5 to 10 times longer than ordinary wheels used in competitive casters. The CartMaster fits nearly all existing meal and beverage carts in today's fleets with a center brake mechanism adjusted and preinstalled at the factory. Load Capacity Up to 165 lbs. 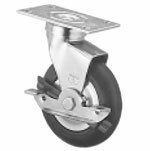 The "silent" donut-style wheel is compounded with a highly resilient, extra-soft neoprene rubber which enables this caster to swivel and roll even on heavy pile carpet. Eliminates the need for floor mats under office chairs. 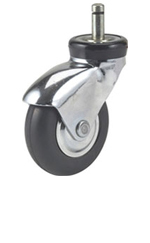 Ball bearing wheels, and standard thread guards only on the 3 inch models, eliminate snags and prevent dragging. 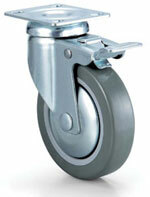 Carpetmaster is an alternative to cheap plastic twin-wheel casters. 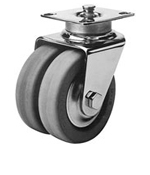 • Double row ball bearing swivel, both raceways equal diameter. Ball bearings standard in wheel. Load Capacity Up to 125 lbs. 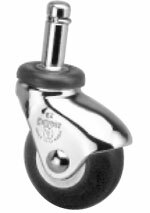 • Double row ball bearing swivel. Both raceways equal diameter. • Thread guards standard on sizes larger than 2"
L oad Capacity Up to 400 lbs. Load Capacity Up to 220 lbs. 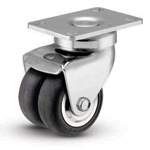 • Low profile, easy swiveling and smooth rolling. Load Capacity Up to 300 lbs. Load Capacity Up to 245 lbs. • Directional Lock (locks swivel) models are available.